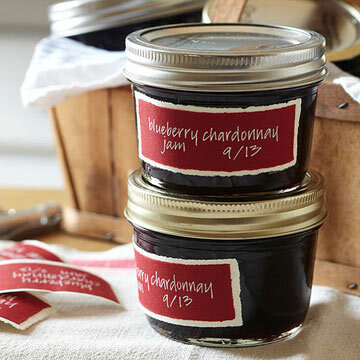 The jam doesn't taste boozy; wine just deepens the flavor, like red wine in a stew. This recipe comes from the Glass Rooster Cannery cooking school and farm store in Sunbury, Ohio. Place berries in a 6-quart heavy pot. Coarsely crush berries with a potato masher to yield 3 cups. Stir in Chardonnay, pectin, lemon juice and butter. Bring to a full rolling boil over high heat; stirring constantly. Add sugar. Return to a full rolling boil and boil for 1 minute, stirring constantly or until jam sheets off a metal spoon. * Remove from heat; skim off foam with a metal spoon. Ladle hot jam into hot, sterilized half-pint canning jars, leaving 1/4-inch headspace. Wipe jar rims; adjust lids. Process filled jars in a boiling-water canner for 5 minutes (start timing when water returns to boiling). Remove jars; cool on wire racks until set. *Sheeting Tip Dip a spoon into hot jam. Lift and hold the spoon sideways. If the jam streams off, it is too thin. As the jam thickens, it will drip. When the drips join in a sheet that falls off the spoon, the jam has set.